We’re proud of the lifestyle diversity in our rapidly-expanding pilot network. As a member of the DroneBase team, you get to decide how frequently you’d like to fly: some of our pilots are “weekend warriors” and fly recreationally, while others have created a full-time living for themselves by flying drones. Take Brian D., for example, who falls into the latter category. 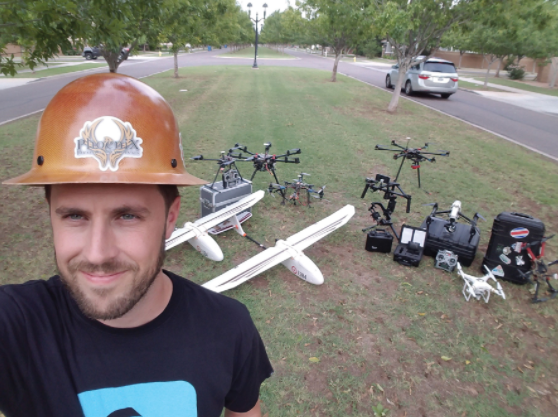 A true “dronetrepreneur”, Brian has made a full-time living for himself in drone services: he runs his own aerial imagery service and has been regularly flying DroneBase missions since our inception. Want to know more about Brian? Read on to learn more about one of our veteran drone pilots! Since the start of DroneBase! Are you a full-time drone pilot? Yes, [I’m a] full time Drone Pilot for many industries. What drone do you primarily fly with? Sensefly Ebee, DJI Product Line, and many custom drone solutions and tools. What was your best piloting experience? Flying for our company in Mexico during a sea turtle release & rescue fundraiser in Acapulco Mexico. [We were] on the beach, chasing scuba boats, filming the sun go down. It was very rewarding to bring awareness, technology, training, and drones into the solution of saving sea-life with our Mexican partners. What was your worst piloting experience? YEARS ago, before you could buy anything like this, we would hand build drones. I crashed a very expensive hand-built drone (that was a birthday gift from my business partner) into a brick wall in a what-will-remain-as-unnamed sports stadium. I was a newer pilot, and the nickname “Homelock” was formed for a while...the “home lock” function is what forced myself and friend Dustin to dive out of harm’s way, thus smashing said beautiful birthday gift into a million carbon fiber pieces...along with my confidence. Brian's passion goes beyond just flying commercial drones - he's highly active in the world of drone policy, too. Needless to say, Brian is a huge asset to DroneBase and the drone community at large. We can't wait to see his impact as our industry continues to expand. Previous PostWhich Drones Have the Longest Flight Time?